Original Editors -Alicia Dupilka & Kristin Gramling from Bellarmine University's Pathophysiology of Complex Patient Problems project. The radiation may be delivered by a machine outside the body (external-beam radiation therapy) or it may come from radioactive material placed in the body (internal radiation therapy, also called brachytherapy). Depend on the area of the body being treated, dose given per day, total dosage, general medical condition and other treatments being given. - It affects many different types of tissue including skin, muscle, ligaments, tendons, nerves, heart, lung, gastrointestinal and genitourinary tract, and bone; in order for a structure to be considered affected by this syndrome, it must be within the radiation field or have tendons, neurovascular innervation or lymphatic flow that travels in the field. - The pathophysiology behind the sclerosis, fibrosis and atrophy is not well understood. Some believe there is a link between vascular endothelial damage and the progression of the fibrosis. When endothelial cells are damaged by radiation they can no longer get rid of the surrounding thrombin causing a profibrogenic effect on smooth muscle cells, fibroblasts, myofibroblasts and other cells. - Peripheral Nervous System (PNS): Pain, sensory loss and weakness caused by external compressive fibrosis of soft tissue and ischemia from fibrosis. - Neuropathic pain involving both the PNS and CNS is common. It is due to damage of neural structures within the field of radiation. - Weakness due to damage of neural structures, including plexopathy and mononeuropathies. - Effects do not always have to be direct. Radiation to the upper leg can cause ankle contractures because the muscles, tendons and vascular structures of the ankle run of the length of the leg. Cervical Dystonia - usually involving the SCM, scalenes, and trapezius. If severe it can affect swallowing, phonation and activities of daily living. Trismus - impaired mouth opening can result from the invasion of the tumor into the masseter and pterygois muscles, the innervation of these muscles, or the TMJ. It can affect chewing, swallowing, oral hygiene and pulmonary function. Diagnostic criteria is dependent on area of radiation and what structures are affected. Dependent on organ radiated, individual tolerance, tumor type, volume radiated and fraction size/dosage. Radiation Esophagitis: often involved in radiation treatment for lung cancer especially when a chemosensitizer is also used. Symptoms usually resolve in 1 to 3 weeks after radiation is finished. - In the circulatory and lymphatic system it can cause loss of elasticity on contractility of vessels. Even though the actual lymph vessels may maintain their shape, fibrosis in the surrounding tissue can inhibit growth of the vessels into tissues that need to be healed. Chronic symptoms: occur months to years after therapy and can include damage to the cerebral vasculature leading to coronary artery disease, transient ischemic attacks, stroke or myocardial infarction. Radionecrosis - results from whole-brain radiotherapy. Secondary tumors may develop and the hypothalamic system may be affected. Symptoms: headache, changes in cognition and personality, focal neurological deficits and seizures. Myelopathy - results from radiation of the spinal cord. May present as Brown-Sequard syndrome or motor neuron syndrome. Plexopathy - results from damage to the brachial and lumbar plexuses. Symptoms may include paresthesias, motor deficits, lymphedema and pain. Physical therapists should always wash their hands before treating a patient who has undergone radiation therapy to protect that client from possible infection. - If adhesions are present in the hip after radiation of the pelvis, be sure to incorporate range of motion activities; early intervention is important to prevent contractures and restrictive scarring. - Post-radiated tissue can tear when stretching so it is important to observe for blanching of the skin during stretching and not to stretch beyond that point. Stretching should be continued 18 to 24 months after radiation therapy has been discontinued. Infection - Therapists should observe carefully for signs of infection in patients who have undergone radiation treatment. The first and only sign may be a fever because the patient may be immunosuppressed and their body cannot create a normal inflammatory response. Exercise  - A successful protocol should include patient education, exercise evaluation and an individualized exercise prescription. - Therapists must monitor vital signs in patients who have undergone radiation treatment because radiation and chemotherapy can leave the lungs and heart tissue permanently scarred. - Patients should be taught to monitor their own vitals including heart rate, respiration rate and rate of perceived exertion (should not exceed 15 to 17) and taught to detect signs of complications such as dyspnea, pallor, excessive perspiration, or fatigue while exercising. Patients should be told not to exercise within 2 hours of chemotherapy or radiation therapy because it increases the circulation and may increase the effects of the treatment. - Studies have shown low to moderate intensity aerobic exercise during the same weeks of radiation treatment can help improve physical function and lower subjective levels of fatigue, anxiety, depression and sleep disturbances. Physical Therapy is usually the first line of treatment for the dysfunctions listed below. Neck Extensor Weakness - emphasize postural retraining through core strengthening, flexibility of the shoulder musculature, and strengthening the cervicothoracic and rotator cuff muscles. This will help reduce energy demands and pain. It is also important to develop a long-term home exercise program. Shoulder Pain and Dystonia - treated through conservative measures because shoulder surgery should be avoided in patients with RFS because damage of the neruomuscular structures often results in poor surgical outcomes. Work on core strength and posture, neck extensor and rotator cuff strength and stretching of pectoral girdle musculature in order to try to restore normal anatomical alignment of the shoulders. There is a potential long-term benefit if the patient consistently follows a home exercise program. Cervical Dystonia - the goal is to restore and maintain neck range of motion and a long-term home exercise program should be utilized. Trismus - Literature is limited but a variety of jaw-opening devices are available to help treat trismus. -Blood clot in the leg. -Low level of albumin (serum-binding protein). -Symmetrical swelling of both legs, extending from the hips to the ankles caused by deposits of subcutaneous adipose tissue. -Subtype of ganglion that often communicates with a joint space. -Most often palpated behind the knee. -Syndrome of real or perceived excessive weight gain. -Physiologic state in which the heart is unable to pump enough blood to meet the metabolic needs of the body at rest or during exercise. -Also called cardiac decompensation or cardiac insufficiency. -Involves the nervous system, muscles, bones, and skin. -Characterized by multiple soft tumors over the entire body associated with areas of pigmentation. -Type of cellulitis that may cause an acute infection of the skin with sharply defined borders. -Parasitic infection carried by mosquitoes. Most damaged occurs after the larva injected has died (approximately 5-10 years later). Blood clot causing swelling in one or more veins, typically in legs. When it involves localized muscle pain patients can be misdiagnosed with fibromyalgia or a rheumatic disorder. Can resemble an underlying lung disease such as COPD. Can resemble other neurological problems and must be differentiated from brachial neuritis, carpal tunnel syndrome, cervical disc disease, cervical myofascial pain, and brachial plexopathy caused by trauma or a secondary tumor. Hyponatremia is a common clinical problem that results from various causes. Hypothyroidism is known to be one of the causes of this disorder. We report a case of metastatic thyroid cancer presenting with severe hyponatremia in association with hypothyroidism induced by pretreatment of I(131) therapy, such as a low-iodine diet and withdrawal of thyroid hormone. Serum arginine vasopressin (AVP) was elevated and urine osmolality was higher than that of serum. Saline infusion and thyroid hormone replacement normalized serum sodium and AVP. Inappropriate secretion of AVP in hypothyroid state was thought to be one of the causes of this hyponatremia. Sonawane S, Gadgil N, Margam S. Therapy related myelodysplastic syndrome: a case report and review of literature. Indian J Pathol Microbiol. 2011 Apr-Jun;54(2):371-3. doi: 10.4103/0377-4929.81643. Fibrosis After Proton Beam Therapy for Non-small Cell Lung Cancer. Jpn J Clin Oncol.2012 Oct;42(10):965-9. Accessed April 10, 2013. There have been no reports describing acute exacerbations of idiopathic pulmonary fibrosis after particle radiotherapy for non-small cell lung cancer. The present study describes the case of a 76-year-old Japanese man with squamous cell carcinoma of the lung that relapsed in the left upper lobe 1 year after right upper lobectomy. He had been treated with oral prednisolone 20 mg/day every 2 days for idiopathic pulmonary fibrosis, and the relapsed lung cancer was treated by proton beam therapy, which was expected to cause the least adverse effects on the idiopathic pulmonary fibrosis. Fifteen days after the initiation of proton beam therapy, the idiopathic pulmonary fibrosis exacerbated, centered on the left upper lobe, for which intensive steroid therapy was given. About 3 months later, the acute exacerbation of idiopathic pulmonary fibrosis had improved, and the relapsed lung cancer became undetectable. Clinicians should be aware that an acute exacerbation of idiopathic pulmonary fibrosis may occur even in proton beam therapy, although proton beam therapy appears to be an effective treatment option for patients with idiopathic pulmonary fibrosis. ↑ 2.0 2.1 2.2 2.3 2.4 2.5 Stubblefield MD. Radiation Fibrosis Syndrome: Neuromuscular and Musculoskeletal Complications in Cancer Survivors. PM R. 2011;3:1041-1054. ↑ 3.0 3.1 3.2 3.3 3.4 3.5 3.6 3.7 3.8 3.9 National Cancer Institute. 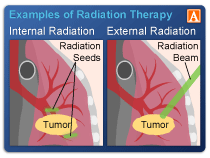 Radiation Therapy for Cancer. National Institutes of Health. 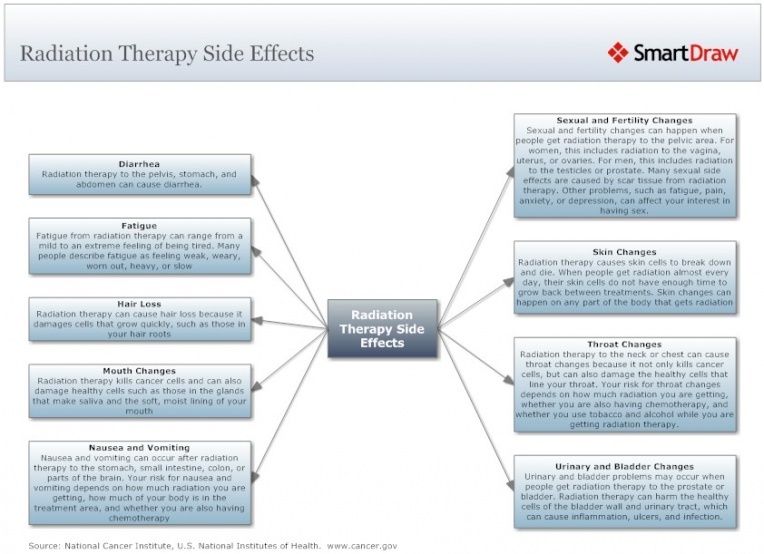 http://www.cancer.gov/cancertopics/factsheet/Therapy/radiation. Reviewed May 30, 2010. Accessed April 3, 2013. ↑ 5.00 5.01 5.02 5.03 5.04 5.05 5.06 5.07 5.08 5.09 5.10 5.11 5.12 5.13 5.14 5.15 Goodman CC, Fuller KS. Pathology: Implications for the Physical Therapist. 3rd ed. St. Louis. Missouri: Saunders, 2009. ↑ 7.0 7.1 7.2 National Cancer Institute. Lymphedema. National Institutes of Health. http://www.cancer.gov/cancertopics/pdq/supportivecare/lymphedema/healthprofessional/page1. Reviewed May 30, 2011. Accessed April 3, 2013. ↑ Stubblefield MD. Radiation Fibrosis Syndrome: What It Is And How To Treat It [Internet]. Houston, Texas: Cancer Forward The Foundation for Cancer Survivors; 2010. Available from: http://www.cancerforward.org/survivor-resources/experts-speak/Michael-D-Stubblefield-MD/radiation-fibrosis-syndrome-what-it-is-and-how-to-treat-it. ↑ 10.0 10.1 Goodman C and Snyder T. Differential Diagnosis for Physical Therapy: SCREENING FOR REFERRAL. 5th edition. Missouri: Elsevier Saunders; 2013. ↑ Stephenson RO. Radiation-Induced Brachial Plexopathy Differential Diagnosis [Internet]. Medscape; Updated Mar 26, 2013. Available from: http://emedicine.medscape.com/article/316497-differential.